Almost 5 months and such a happy little thing! She just learned the full rotation of rolling and is constantly waking herself up because of it! 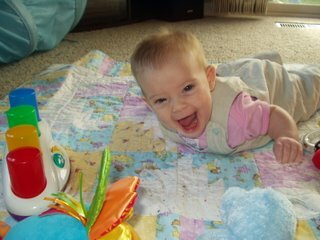 She is developing her own personality and is always ready to smile for anyone, anytime. could i get some love sent my way and see some new pics of the babes posted?